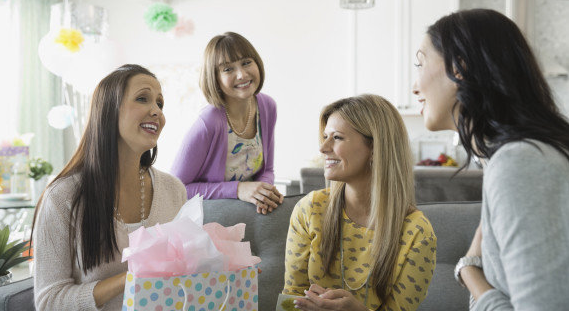 Get the laughs going at your baby shower with one of these simple and silly games. Set the wheels in motion for this game when you send out invitations to the shower. With each invite, include a note asking guests to bring a picture of themselves as baby. As guests arrive, assign a number to each picture and post it up on the wall. Have each guest guess which picture corresponds to each guest. After everyone is finished cooing over the photos, give a prize to the person with the most matches that matched up. Place at least 10 common baby items inside a diaper bag: a bib, teething ring, rattle, bottle, diaper, spit-up cloth, tube of Desitin, pack of wipes, hand sanitizer, changing pad, plastic bags, extra outfit, pacifier, baby hat are just a few goodies. Give each guest a pen and paper before passing the diaper bag around. Without looking, and with a timer set to 30 seconds, each person sticks a hand inside the bag and tries to identify as many items as possible. Person with the most items wins. Your guest gets to keep the diaper bag and essentials. Pass out sturdy paper plates and markers to all of your guests. Let them know they'll be drawing a picture of the baby, and the best sketch will win. The catch is that everyone has to draw with the paper plate on his head. It's fun and everyone will laugh. Get crafty at the shower. Buy enough onesies (multiple sizes) to give one to each guest. Stretch each across a piece of cardboard and pass them out at the shower along with fabric paint and miscellaneous baby-safe decorative elements. Invite everyone to create a unique onesie design for the little infant to wear. Some moms-to-be like this, others don't so make sure you ask. Have each guest measure out a length of yarn that they think is the size of Mama's waist now. Cut the string to the length of your guess. Closest accuracy wins.